When I was about ten or so, I took a cooking class at the local rec center. Being that it was for children, it covered the simplest of recipes. I don't remember what all we were taught in the few weeks the class was offered, except for the complete meal that was a culmination of all that we'd learned. We made spaghetti with tomato sauce and a dessert called Pudding in a Cloud. 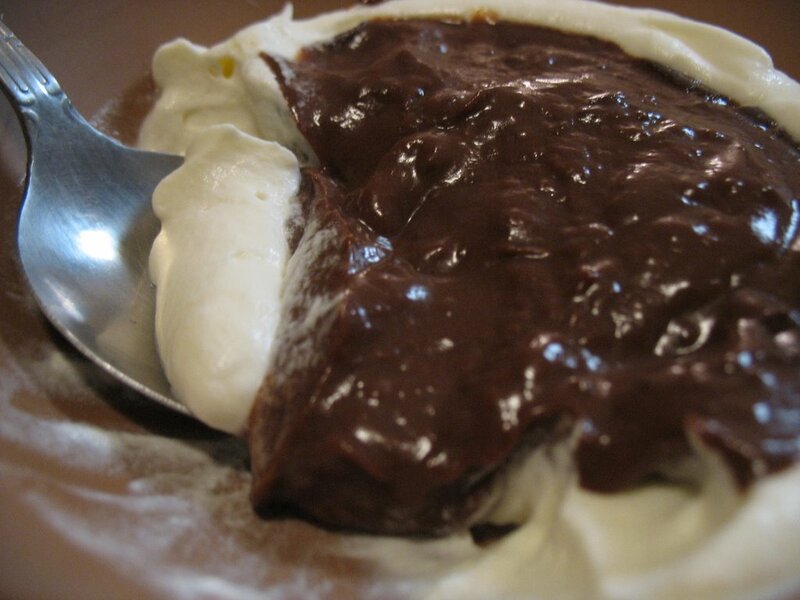 This ridiculously easy-to-make dish was comprised of a bowl of Cool Whip topped with a generous helping of Jello chocolate pudding. It took little effort to open a container of non-dairy topping and mix together milk and a sweetened brown powder. Sixteen years later, I may be a "grown-up," but I still love a simple but tasty dessert. I can't, however, bring myself to use Cool Whip when I know the true joys of real whipped cream, and I'm more likely to stock baking chocolate in my cupboards over instant pudding mix. Honestly, though, making pudding and whipped cream from scratch doesn't take much more effort than using the processed stuff — and you get a richer, more "adult" flavor. Try it. I guarantee you won't be disappointed. Just before serving, combine cream and sugar in a cool metal bowl, then whip until soft peaks form. Divide into two bowls, then divide pudding on top of the "clouds." I've had this, but I don't remember when, or where. My mom used to make the cook-and-serve pudding quite a bit when we were growing up. It's not quite from scratch, but you talking about the "skin" reminded me of it. I always hated the skin, but loved the pudding. I love this dessert and remember it well. But, made this way, it would even better. Thanks for reminding me of this.